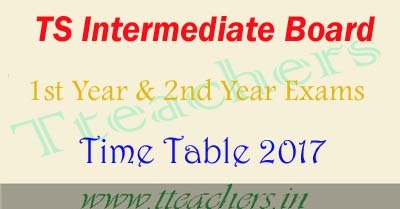 TS inter time table 2018-2019 1st Year 2nd Year ipe exams dates Telangana : The TS Intermediate Board Time Table 2018 for Junior Inter(1st year) & Senior Inter(2nd year ) will publish on the Inter Board official website of Telangana. Students who are looking for the TS Board Intermediate Time Table 2018 can check the Telangana State Board Class 12th Exam Date Sheet, TS inter time table 2018 on our website tteachers.in. The Telangana Intermediate Board will announce the Intermediate annual Examination Time Table 2018 in the Month of November Last week. May be inter exams will start in the Month of March First week 2018. The TS Board Inter 1st year 2nd year Examination Date Sheet 2018 is available in PDF Format on provide link below . Board of Intermediate Examination (BIE),Telangana will be released the class 11th and class 12th intermediate board exam time table 2018, TS inter time table 2018 in the month of November 2018. Telangana Intermediate Annual Exams Dates announced by the inter education board officials,As per exam schedule,Inter Exams starts from 28th Feb to 17th March 2018.TS Inter Practical exams will be conducted from 01 February 2017 to 21 February 2017.
a) Ethics and Human Values Examination is proposed to be conducted on 27 -01-2018 from 10.00 AM to 1.00 PM as was done earlier. b) Environmental Education Examination is proposed to be conducted on 29-01-2018 from 10.00 AM to 1.00 PM as was done earlier. c) The Practical Examinations are proposed from 01-02-2018 to 21-02-2018 (including Sundays) for both General Intermediate and Vocational courses.